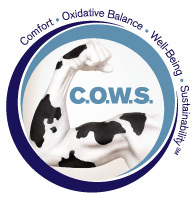 A dairy cow that is able to be highly productive will have a reduced carbon footprint. So for every unit of milk she produces, there is less environmental impact. To help herd productivity, everything must be closely monitored and managed, including lameness. The dairy industry in the United States has achieved significant improvements in productive efficiency, producing more milk with fewer cows. From 1944 to 2007, the industry reduced the number of cows from 25 million head to 9 million head – while at the same time increasing milk production from 117 billion pounds to 186 billion pounds (USDA-NASS, 2008). Among the most important factors in maximizing efficiency is the availability of comfortable stalls. Stall design and management has a major impact on lameness and other aspects of cow health. Dairy products are high-value nutritional products that are produced in a highly efficient, sustainable and responsible manner. The increases in efficiency are possible because of improvements in things like management, technology, genetics and feed additives. In order for a cow to maintain high levels of efficiency, she needs to be healthy and comfortable with adequate areas to lie down and rest. Modern dairy housing systems are designed to maximize efficiency.Research has shown that aspects of the free stall such as the quality of the lying surface and stall dimensions influence stall use and cow comfort. Stall design and management has a major impact on lameness and other aspects of cow health. Such problems are very costly for dairy producers and they impact the overall ability of cows to produce milk at high efficiency levels. Karen Luchterhand, ruminant technical services manager at Novus International, Inc., explains how a program new to Mexico helps dairy producers analyze their herd's daily activities and provides them with information to help ensure the comfort and well-being of their cows. This program is expected to be available to producers in northern and central Mexico later in 2019. The demand for liquid continues to rise, specifically in developing regions, because of the exponential advancements in the feed and animal protein production industries. Producers and feed formulators are becoming more precise in their animal nutrition and incorporating the latest technologies, including utilizing the benefits of methionine supplementation in livestock and poultry. Annually, the Novus offices in North America band together for a fundraising campaign to help support organizations in their communities through the United Way. As part of its effort to cultivate sustainable people, Novus matches causes and charities of significance for its employees dollar-for-dollar.